Ksenya Komshilova, Natalya Mazurina, Ekaterina Trosina, Teona Shvangiradze, Pavel Bogomolov, Galina Melnichenko, Ivan Dedov. Objective: Nonalcoholic fatty liver disease (NAFLD) is closely associated with obesity and metabolic syndrome (MS). Liver biopsy can verify the histological form of NAFLD. The aim of the study was to evaluate the relationship between histological indicators of liver damage and metabolic parameters. Material and methods: 80 patients, median age 45 [41.5; 47.5], with abdominal obesity and US signs of NAFLD were included in the study. All patients underwent percutaneous liver biopsy. Glucose levels during OGTT, total cholesterol, high-density lipoprotein cholesterol (HDL), low-density lipoprotein cholesterol (LDL), triglycerides (TG), ALT, and AST were measured. Fasting insulin, serum adiponectin, C-reactive protein (CRP) and active plasminogen antigen activator inhibitor-1 (PAI-1) were determined. Results: NAFLD was confirmed in 77 patients (96.3%), NASH  in 64 cases (80%), steatosis - in 11 cases (13.8%). In patients with steatosis, 72.7% had dyslipidemia, 63.6% had impaired glucose metabolism, 63.6% had insulin resistance (IR); with NASH  in 93.8%, 78.1% and 100%, respectively. Adiponectin level correlated negatively with IR indicators: HOMA-IR (r = - 0.45; p = 0.023) and fasting insulin (r = - 0.35; p = 0.024). NASH patients had significantly higher levels of CRP than those with steatosis: 3.8 [2.1; 6.7] mg/L vs 1,1 [1.0; 1.7] mg/L, (p <0.0001). PAI-1 activity correlated positively with anthropometric parameters, IR, the level of CRP, and negatively with adiponectin concentration. Conclusion: Metabolic disorders in patients with NAFLD are dependent upon the severity of the liver damage and the morphological stage of the disease. Copyright © 2019 International Journal of Surgery and Medicine All Rights Reserved. 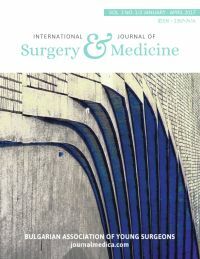 Subject to change without notice from or liability to International Journal of Surgery and Medicine.